You say Nightwing, I say Blindside. Potato, potahto. I felt kind of bad trashing Marat Mychaels in the Caption Contest post, so I thought I should look him up online and see what he's been up to since 1992, when the Brigade issue in question was printed. I mean, 17 years is a long time, I figured he'd probably improved since then. Which, clearly, he has, as you can see at his web site. 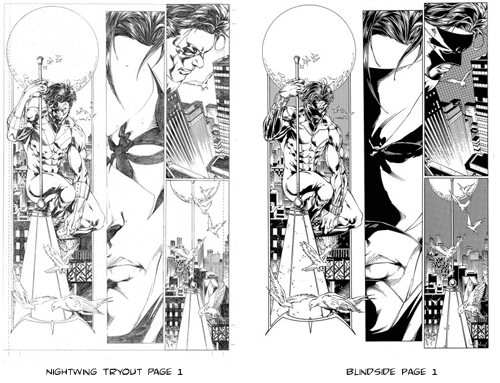 But while poking around, I noticed a page from his Store, titled "Nightwing Tryout Page 1" (already sold) that looked an awful lot -- an AWFUL lot -- like his gallery page of Blindside. Whoever the heck that is. Look, I'm the last person in the world to cast aspersions on someone for re-using art -- I do it all the time -- but damn. I assume the Blindside work came first, and then was later redrawn with Nightwing's costume as sample submission. But why bother? If you're already a published artist, why do you need to try out for something? And if it was the tryout that came first, did he use that basic script later for Blindside? There's nothing unethical about any of this as far as I can see (assuming the Nightwing tryout didn't come with a pre-written script), it's just kind of weird. I don't know Marat Mychaels at all, I'd never even heard of him until this morning. His art's gotten much better, and he's a published, successful comic book artist, which is far more than I can say. So props to him for that. It just seems weird, is all. This entry was posted in Randomosity, Retroviews. Bookmark the permalink. 3 Responses to You say Nightwing, I say Blindside. Potato, potahto. Maybe it was the other way around? Maybe he used his Nightwing tryout for his Blindside? I dunno, it’s a little odd. That’s definitely for sure. The pages in question are from Blindside 0. Blindside 1 was printed through Image in 1996. The relaunch of Blindside just occurred at Wizard World Chicago last month and the page above is the first in the issue. Definitely is weird. I’m a huge Night Wing fan but this is the first time I have ever seen the Night Wing – Blindside connection. I agree with Tony maybe it was the other way around.